Click the button below for free access to the first session of the Natural Depression Treatment program. When we see depression clients for the first time, we find they are exhausted, terrified, and confused. They are exhausted from all the worry and poor sleep, they are terrified that there is something terribly wrong with them that they will never be able to fix, and they are confused by all the conflicting information they are getting on depression. "Why is this happening to me?" "What is wrong with me?" "Am I ever going to get better?" At Uncommon Knowledge we treat depressed people on a regular basis with results that astonish both them and the health professionals who have tried to treat them before. The only reason we can do this is because we work from a relatively new piece of research that few people within the psychological community know about yet. Since we published this on the internet in 2001, thousands of people have let us know how it has revolutionised their understanding of depression, and given them their life back. When you understand this new approach, depression loses its power to confuse and scare you. We know what depression is, and you can too. (And it's nothing to do with chemical imbalances, as you had probably guessed). From this understanding(1), we have developed a careful blend of psychological techniques from cognitive therapy, behavioural therapy, interpersonal therapy and hypnosis. We know it is teachable because we train other professionals to use it too. We have taken our approach to treating depression and over 2 years packaged it into a comprehensive online program. We have created many programs, and the depression program was the hardest to do because it had to be perfect. 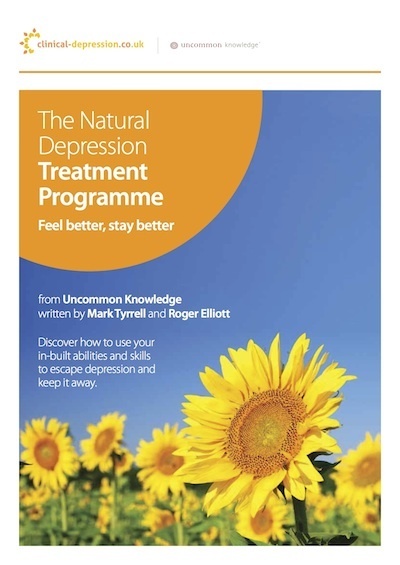 The result - the Natural Depression Treatment Program - is the most powerful self-help tool available today for depression. It is your way out of depression and back to a normal, fulfilling life. And it will keep depression away too. It is important to understand that depression de-motivates you and so the idea of starting such a program may seem difficult. That is why we have made it easy (even fun!) to read, and it is carefully structured in a step-by-step way. When you are depressed your brain is exhausted, which makes learning difficult. So each 'session' is backed up by an audio download to give you the chance to relax regularly and absorb new information slowly. Hypnosis for depression relief is so quick because of the 'recovery effect' it has on an exhausted brain. What you need to understand is that this program does not replace the help you can get from a qualified professional - having someone there can make all the difference - but if you are getting help, it will make that help all the more effective. On the other hand, if you are suffering from mild to moderate depression, and just want to know how to get rid of it, and stop it coming back, this is perfect for you.